The highest quality solder, from Victory White Metal. Flows smoothly, and is easy to work with. Excellent quality solder specifically made for the stained glass craft by an industry leader, Victory White Metal. 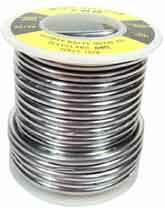 This 60/40 solder comes in 1/8" wire form on a 1 pound spool. Our customers rave about this solder. Seriously. 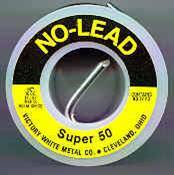 This no-lead solder is composed of approximately 97 percent tin and 3 percent copper. Because it doesn't contain silver, it's not quite as shiny as silver solder, but it's definitely shiny enough, according to our customers. It's also not as expensive as silver solder. This would be ideal for copper foil projects that you would like to be completely lead-free. Nothing flows quite as well as the traditional 60/40 lead/tin solder, but you can get good results with this solder with a little bit of practice.